LBX Company was recently honored as recipient of the 2013 Martha Layne Collins Award for International Trade Excellence at the Kentucky World Trade Day annual awards luncheon which featured over 400 representatives from business, industry, and government sectors. This prestigious honor recognizes Kentucky companies successfully engaged in international trade. 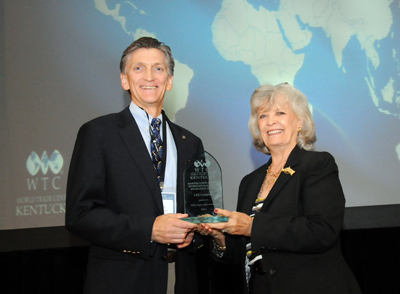 Honored and presented by Martha Layne Collins, former governor of Kentucky, LBX Company selection was based on a four-part evaluation of criteria including outstanding commitment to and performance in international trade as well as evidence of executive management and organization-wide commitment to international business. LBX's recognition was due to LBX’s commitment to international trade evident by international sales growth significantly outpacing domestic sales growth as well as the investments made internationally. LBX do Brasil, located in São Paulo, Brazil, opened in 2012 to support sales growth in Latin America.